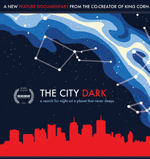 One of my favorite documentaries out of SXSW this year is Ian Cheney’s “The City Dark,” a film that explores the fading night sky, which we take for granted, and the problems with artificial light polluting our lives and planet (residents near an Upper West Side Duane Reade store in NYC know this well lately). The doc took home a prize for best documentary score, which is by Brooklyn’s The Fishermen Three (collaborating with producer Ben Fries), and now you can sample one of the great tracks from that score (here or here). Titled “Western Space Dance,” it’s kind of like if AIR did something with a plucky western score-style guitar. Strangely enough, a twangy song by All India Radio just came up on my Pandora mix, which is also quite comparable. Compared to ‘King Corn,’ ‘The City Dark’ is a less informative and seemingly less crucial doc, but on an aesthetic level I enjoyed it a lot more. It has a kind of abstract and new age-y tone, rendered by the jangly ambient techno score by The Fishermen Three and Cheney’s quiet, contemplative voice-over narration. Check out the trailer for the doc, which also features some of the music, after the jump. Hopefully the film will released soon so others can check it out. Does anyone know the name of the song in the trailer and who it is by?